The removal of Ghaddafi eventually resulted in the loss of four Americans at the Benghazi consulate, including the US Ambassador to Libya. The conspiracy theories surrounding that whole story continue to swirl as a result of the US Government laying blame at the feet of a small time movie producer who dissed the “prophet” Muhammad. Were it not for the valiant self-sacrifice of those two former SEAL’s, Tyrone Woods and Glen Doherty, there would have been dozens of dead American foreign service members. The Obama Administration continued to press Egypt to oust Hosni Mubarak, a man who was no friend to the Muslim Brotherhood. You see, the Muslim Brotherhood is not new to Egypt. In fact, Egypt is the Ikhwan’s birthplace in 1928. Hassan al-Banna founded the Brotherhood to bring back the Khilafah (caliphate) which had been outlawed by the new government of Turkey after Mustafa Kemal Ataturk led an effective revolution and became Turkey’s first president in 1922. The Brotherhood continued to grow in strength and during the time of Nasser’s coup d’etat of 1952 were beginning to create a problem. By 1954, Nasser had outlawed the Brotherhood and imprisoned thousands in concentration camps. One of these was Seyyid Qutb, author of Milestones, among many other publications. Qutb is known as one of the most influential Muslim thinkers of modernity. He has influenced men like Osama bin Ladin, founder of Al Qaida, Ayman Zawahiri of Islamic Jihad, and Anwar al-Awlaki, the American grown terrorist who preached at the Falls Church, VA mosque attended by 3 of the 911 hijackers, and one Nidal Hassan, the Fort Hood jihadi who killed 13 unarmed soldiers in a classroom, and wounded 30 more. bombing. Rahman is also a student of Seyyid Qutb. When Anwar Sadat was assassinated there were several others killed and over 20 people wounded. Hosni Mubarak was among the wounded. The fate of Egypt is in the hands of who ever can keep in power. History has shown that little more matters in Northern Africa. As has been the case for the last century, the West’s interests in the region, and those citizens of those countries who do not adhere to a Muslim Brotherhood’s ideology, aka Sharia law, are at the mercy of the power holders. When the American President calls upon a people to support the Muslim Brotherhood, an organization who believes that Sharia Law must be the governing authority, and then assists the MB in gaining power, he must bear responsibility for the consequences. Those consequences include Coptic Christians, as well as Jews, who have been terrorized, killed, beaten and burned out by the consenting voices of the Muslim Brotherhood government (Morsi). Obama owns that. 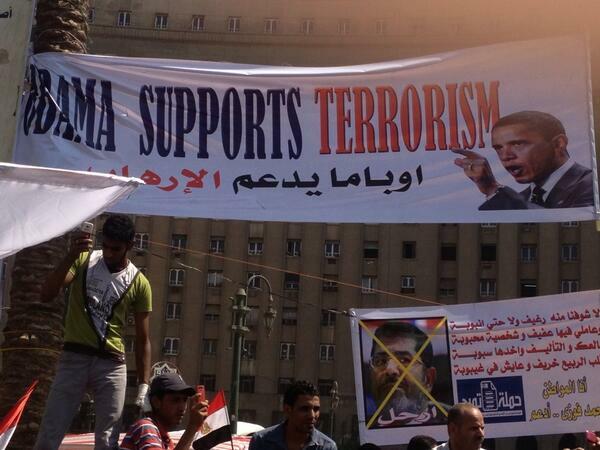 Egypt has officially declared the Muslim Brotherhood to be a “terrorist organization”. On March 24, 2014, the new Egyptian government which took down the short-lived Muslim Brotherhood government after it terrorized its own minority citizens, tried 1200 Brotherhood members. 528 have been found guilty of murder and have been sentenced to death. The remainder have yet to be sentenced. Time will reveal whether Egypt will actually carry out the sentences, but it sure looks as if the country has had a belly full of the Muslim Brotherhood. Saudi Arabia and the United Arab Emirates have even gone so far as to declare Muslim Brotherhood a terrorist organization! Under Nasser, Egypt was an ally to the USSR. Sadat opened up to Western alliances and was an important ally to the US during the cold war era, and contributed to the security of Israel. Now, after a perceived betrayal by the United States under Mr. Obama, Russia is once again at the forefront of Egypt’s allied partners. What a pity that Vladimer Putin was handed the opportunity to take the high moral road in both Egypt and Syria, where hesitation from the US resulted in Al-Qaida and it’s allies to basically wrench the uprising against another evil dictator, Bashir Assad, out of control of forces friendly to the United States. This has led to a sadly impotent foreign policy which is of no practical use concerning The Crimea and yet to be seen aggression by Russia. Turkey is now the next one who appears to be falling under Putin’s spell, as a result of a lack of trust or confidence in America, and has already been taken from the inside by the Islamist movement. There will be more to come on this for sure!